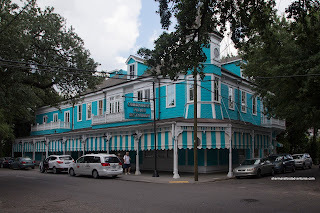 On our last day in New Orleans, we had reservations for the Jazz Brunch at Commander's Palace. This was no small thing as this was yet another one of my bucket-list items. Commander's Palace has so much history in the Garden District in NOLA and was briefly closed after Hurricane Katrina. After renovations, it reopened in 2006 and has continued to serve haute cuisine complete with their legendary service. We ended up taking the St. Charles street car to Washington and took the short 2 block walk down. Upon entering, we were warmly greeted by the professional staff. They do not fool around here as there is a dress code (do not attempt to wear shorts or t-shirts here!). For those unfamiliar with the menu, the entree price includes both appetizer and dessert. In my opinion, that makes their prices actually quite reasonable with all things considered. I decided to start with one of their classic items in the Turtle Soup featuring veal fond and crushed lemon finished table side with a splash of sherry. 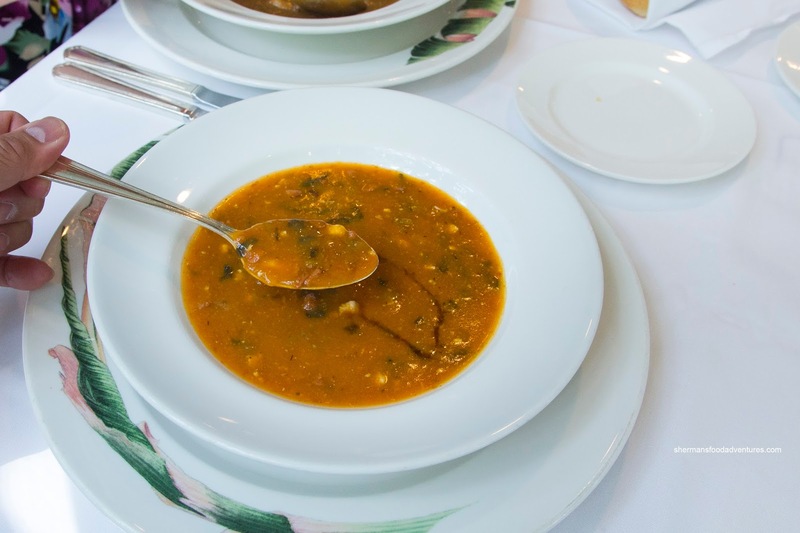 This reminded me of oxtail soups of years past where the rich meat flavour of the fond hit my palate strongly where the flavor lingered. Of course the uncooked sherry was sweet and announced itself confidently. There was a balancing tanginess and a good amount of pepperiness. 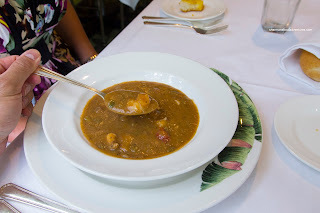 Viv decided on the Seafood Gumbo which was rich and Earthy. 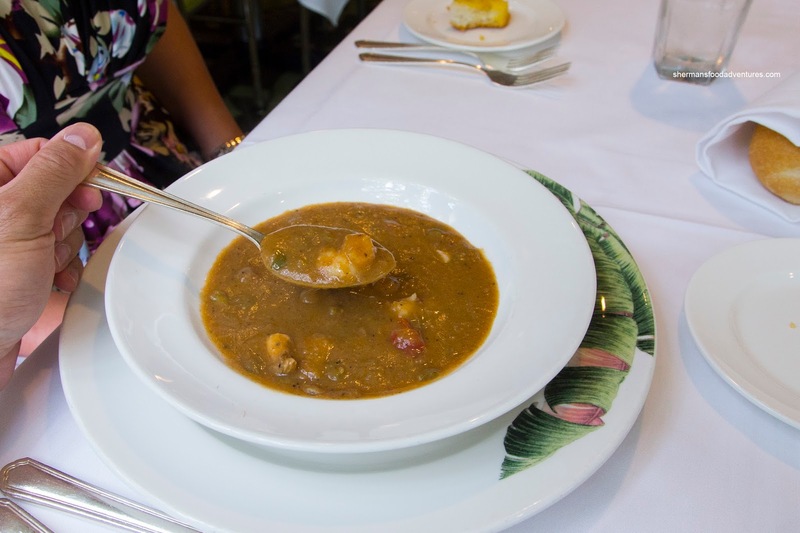 The natural juices of the seafood seeped into the gumbo and there was an appealing sweet brininess. We found the viscosity to be on point while the seafood was on point in terms of textures. 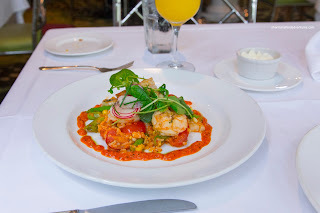 For her main, she had the Louisiana Shrimp & Romesco Rice featuring marinated white shrimp, popcorn rice, Romesco, asparagus, tomatoes, Parmesan, sweet corn & compressed basil oil. The cook on the shrimp was perfect being buttery with a light snap. It was mildly sweet and aromatic. We absolutely loved the garlickiness of the Romesco as well as the nuttiness. The rice was full-flavored as a result and the fresh corn off the cob provided bursts of sweetness. Tart and plump, the tomatoes added the necessary zip to the dish. 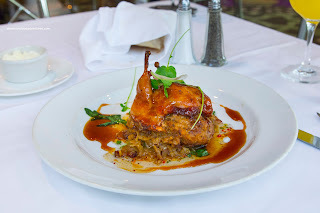 Upon the recommendation of our server, I had the Sugar Cane Lacquered South Texas Quail stuffed with charred chili & popcorn rice boudin. The quail couldn't have been prepared any better. It was moist and tender with well-rendered skin. I found the boudin to be peppery and smoky with savory depth. Finally, that sugar cane glaze was money. It provided a sweet balance to the rest of the flavors. For dessert, Viv had the Commander's Palace standard in the Creole Bread Pudding Soufflé. This sported a large meringue top that was airy and lightly sweet. Underneath, the rich and creamy bread pudding was very sweet with hits of cinnamon and nutmeg. It was finished off table side with a warm whiskey sauce that was mildly sweet. 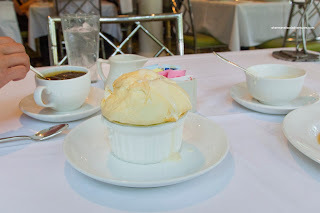 That was a good thing as the bread pudding itself was a bit too sweet for us. However, I can definitely see many people liking this due to the wonderful texture and flavor. 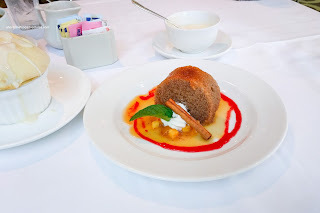 For myself, I had the Spiced Peach & Bourbon Gâteau featuring a rich brown butter cake, cane syrup poached peaches, peach coulis, and Chantilly whipped cream. This arrived warm and aromatic. The bourbon soaked cake was moist where the hit of cinnamon was strong. I thought the poached peaches were tender and delicious. So was Commander's Palace worth the visit? For me, yes. It met my expectations in terms of food and service. A must-do when in NOLA.